United States and Argentina to work together more closely to cut off Lebanese terrorist group's funding networks in Latin America. The United States and Argentina will work together more closely to cut off the Lebanese terrorist group Hezbollah's funding networks in Latin America, both nations' top diplomats said Sunday, according to AFP. Argentina has a large Lebanese expatriate population and U.S. authorities suspect groups within it of raising funds through organized crime to support the Iranian-backed Hezbollah. 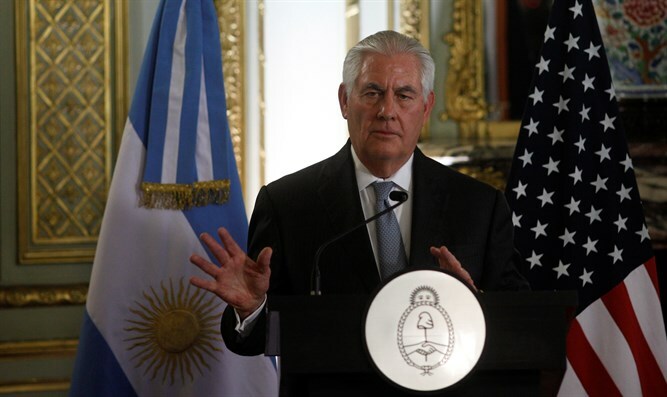 Secretary of State Rex Tillerson was in Buenos Aires for talks with his Argentinian counterpart Foreign Minister Jorge Faurie, and afterwards they confirmed that the issue had come up. "With respect to Hezbollah, we also did speak today in our discussion about all of the region about how we must all jointly go after these transnational criminal organizations -- narcotics trafficking, human trafficking, smuggling, money laundering -- because we see the connections to terrorist financing organizations as well," Tillerson was quoted as having said. "And we did specifically discuss the presence of Lebanese Hezbollah in this hemisphere, which is raising funds, obviously, to support its terrorist activities. So it is something that we jointly agree we need to attack and eliminate," he added. Faurie, standing by Tillerson's side at a joint news conference, agreed, saying that South America had become a "zone of peace" and that outside groups must not be allowed to jeopardize this. "And, as Secretary Tillerson said, we need to intensify every possible exchange not only in terms of dialogue but also in terms of information on the actions of these groups which take advantage of transnational crime to foster their interests, which Argentina certainly does not agree with," he said, according to AFP. Hezbollah is blacklisted as a terrorist group by the United States, which has several times sanctioned the group, most recently on Friday, when six individuals and seven businesses with alleged links to Hezbollah financier Adham Tabaja were slapped with sanctions. Washington has in the past imposed sanctions on Hezbollah leader Hassan Nasrallah and two other members of the organization, for their alleged role in aiding the Syrian government in its crackdown on opposition forces. Tillerson's meeting in Argentina follows a December report that the Obama administration actively thwarted a Drug Enforcement Agency (DEA) operation into Hezbollah's drug smuggling operations in the United States in order to appease Iran ahead of the 2015 nuclear deal. Last month, United States Attorney General Jeff Sessions ordered the Justice Departmentto establish an investigative team to probe organizations giving support to the Iranian-backed terror group. In 1992, the violence of the Middle East erupted in Argentina, when bombers attacked the Israeli embassy in Buenos Aires, killing 29 people. Two years later, an attack on a Jewish community center in the city left 85 dead. None of the bombers were ever convicted, but international investigators have pointed to Hezbollah and to senior Iranian officials as being responsible. U.S. experts believe that Hezbollah, working under close Iranian supervision, has built a fund-raising network in Latin America that profits from drug smuggling to fund its political and military activities.